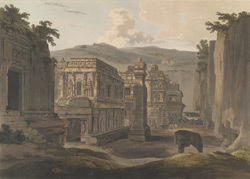 Plate 13 of 'Hindoo Excavations in the Mountain of Ellora near Aurangabad,' engraved by Thomas Daniell after the drawings of his deceased friend James Wales, which Daniell regarded as the sixth set of his 'Oriental Scenery.' This is a side view of the Nandi pavilion which is at the entrance of the court that surrounds the Kailasanath. This pavilion is flanked by a tall monolithic ceremonial column, and the remains of a monolithic elephant. At the centre is the great assembly hall, leading to the main lingam shrine surrounded by subsidiary shrines. A pillared verandah encloses the entire complex. On the walls carved panels depict the different aspects of Shiva.